Stonewall Jackson has another event coming up this weekend. Two food trucks will be there: Easy Slider and Rockstar Bake Shop. This year 13 eggs-traordinary backyard coops will be on the self-guided tour through the area surrounding White Rock Lake. Tour maps can be purchased for $5 at headquarters, and along with the map visitors will receive a goody bag packed full of magazines, coupons, and other valuable information and giveaways. Last year, there were 2000 visitors and a great many who lingered at headquarters (the Stonewall Garden) for all the great things happening there. Many just enjoyed the garden, but also the 4-H chickens, chicken care seminars, and of course the garden itself. We also have vendors, like the Honeybee Guild and Texas Worm Ranch. 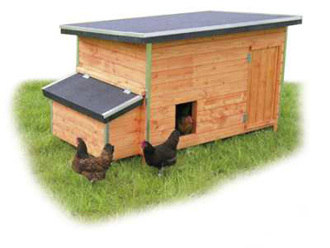 Enter a raffle to win your very own mobile chicken coop! This year, a couple food trucks will be on site for really great eating too! It is a really fun event that attracts folks from all over, not only in our neighborhood but certainly many East Dallasites.